Dernière Volonté - Brettanomyces | Brasserie Dieu du Ciel! Bottle re-fermented with Brettanomyces, the characteristic aromas of these wild yeast intermingle with the floral bouquet of the beer. Its warm leathery flavours envelop the equilibrium achieved between the malt and the notes of hops. Imperceptibly bitter, the hoppy finish is counterbalanced by the Belgian yeast esters, revealing a hint of spicy overtones. Available from September to December. This one pours a light golden straw yellow color, with a big fluffy head, and a lot of lacing. This one smells like bitter pine, stone fruit, clove, sharp grassiness, barnyard/horse blanket, spiciness, and orange peel. I don't know the age of the Brett-ified Belgian IPA, but I don't think it matters too much. It's still got a solid hoppiness to it, with a really well integrated Brett funk- spicy and filled with creamy funky peach flavors, with a grassy funk. The hop character also feels a little bit spicy. I don't get much (if any) malt character here. This is medium bodied, creamy and well carbonated, with a very solid level of drinkability. 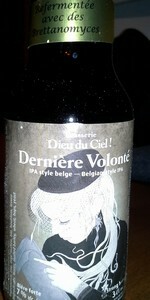 Dieu de Ciel is easily one of the best breweries in Canada- Bellwoods is the only other brewery in this top tier. It was long since I did not try a Canadian beer that was so good. In my country, Tacloban, there are very few beers from Canada. This one liked it a lot, a lot. I have discovered people who make a beer of great quality. A great beer. I will review brand and beer. Overall- The flavors on this one worked really well, and the creamy mouthfeel just served to enhance them. This was a really enjoyable beer. Very nice fruity brett-forward belgian IPA. Very nice balance with a juicy mouthfeel. Peach, citrus, mango but also some floral notes. Very drinkable. Pours a slightly misty straw yello with a thin white head and good lacing. Nose of barnyard and leather over spicy malt sweetness. Taste hugely complex and goes on for ever. Lemon, grapefruit, candied fruit, leather, barnyard, hay and horse. This is a beer that has a serious potential to age and will continue to develop. This is a very good Belgian Ipa. Pours a golden cloudy yellow with a nice 1 inch top that faded to a white ring. There is lots of noble hoppiness and a great feel from the malts. Bottled in sept 2016 and opened in June 17. I likes this as a very interesting version of a blond Leffe. It should age well if you can keep the bottles in the closet! Just opened the 2017 I saved for 2 years... It is still great! It has acquired a real smoothness while still staying in the original style. Plenty of carbonation and a lasting head. I wish I had kept more. Dirty straw with a slight haze, pours a little head, but it quickly recedes to a thin ring. Aroma isn't intense, but there's a pleasant depth...candied pineapple, mango, papaya, with a bit of citrus and leather. Flavours echo the aroma. There's a dry bitter finish, but the alcohol is very subtle. I'm tired of bombers, but 12 oz just seems too small. Hazy and veiled golden color, with a floating misty cloud of yeast, and very low activity. Foamy and slightly creamy white 3-4 finger head, lasting around 10 minutes, with decent legs. Flavors of Brett yeast, grapefruits, wheat, hay, lemon, clove, floral and herbal hops. Slick and smooth medium body with crispy carbonation. Strong strength finish, not quite vinous but slightly dry, a bit cheesy and soapy with a powerful barnyard feel of straw and grass, including some notes of barley and leafy dry hops. Resembling more like a Saison than IPA. The intensity is really nice, but gets quite chalky on the tongue for a long while, but I don't find it zesty nor sharp enough for an IPA, it's thinner like a Saison. Still providing very good flavors, I find it lacks a bit of complexity and subtleness, too much Brett yeast. Overall high quality craft. Dernière Volonté - Brettanomyces from Brasserie Dieu du Ciel!